Teacher Appreciation Week will be May 7-11, 2018. 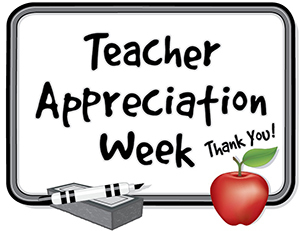 Although we appreciate our wonderful teachers throughout the entire year, this is a special week where we take the extra time to thank our teachers. Room parents will send home details about each classroom. There will be gift themes for each day. They are all optional and very reasonable. For example, students may be asked to bring one flower to school. that will be combined to make a large bouquet for the teacher. The PTA also hosts a luncheon for teachers during lunch in the PTA room. We will be looking for volunteers to sit with classes during lunch so the teachers can enjoy the luncheons. Stay tuned for more details about Teacher Appreciation Week!